All of us with careers in marketing are bound together by the same goal: to know and understand our audiences so well that they could practically be our family. Of course, that’s not something that just happens overnight. Building strong relationships with customers takes time, effort, and above all: loads of research. But getting quality data from your customer base is easier said than done. Marketing research can be difficult to uncover the real activities, interests, and opinions of your customers. Using psychographic data can be a great way to gain a clearer picture of your audience so you can create more effective marketing campaigns within your strategy. In this blog post, we’ll take you through all the ins and outs of a successful psychographic research strategy to define your ideal customer profiles. It’s unfortunate that the term has almost become synonymous with this unpleasant image of Machiavellian businessmen pulling strings behind Zuckerberg’s curtains. Psychographic research by itself is not a harmful practice. In fact, when used appropriately, both customers and companies should be able to see the benefits. In a nutshell, psychographic data is that one missing piece of the customer profile puzzle that has been there the whole time. For a long time, marketing has been primarily driven by demographic, transactional, and behavioral data. Or as you could put it: the who, what, and how of describing your audience. While those parameters are a good place to start setting some boundaries for your target audience, they still leave the matter of why out of the equation. Psychographic data can provide that piece of information to give you the full picture. It can help you to finally understand the reasons and motivation behind the behavior of your customers. The big difference between the two lies in the type of questions you’re asking. Demographics are rigid, absolute statistics used to chop up a large population into broad segmented groups. Psychographics, on the other hand, rely on more dynamic measurements, mainly concerned with what’s going on inside the mind of the consumer. Put differently, try thinking of it like a new pair of glasses. If you only use demographic, behavioral, and transactional data, you’ll only see the blurry outline of your customer. With this picture, you roughly understand the idea of what’s there, but you’re not quite able to make out the details. However, a shiny new pair of psychographic spectacles suddenly puts matters into laser-sharp focus. 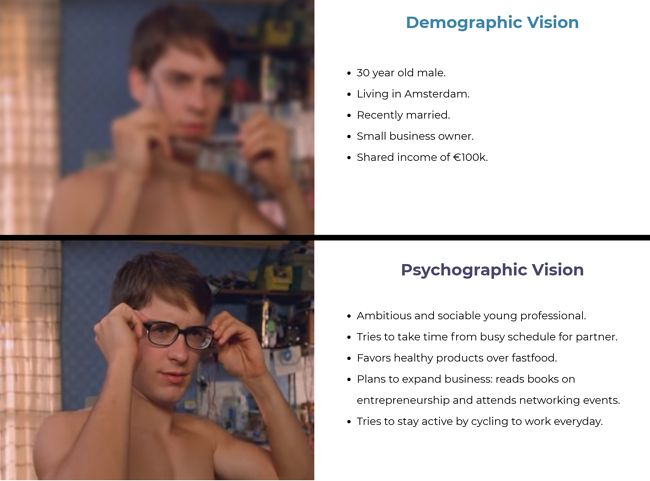 To illustrate this, consider this example, Peter being, described with demographics as opposed to psychographics. As you can tell, the second version is a lot more informative than the first. With just five snippets of information, we can fill in some of the missing details to understand who Peter really is. Based on that, we can start making some informed predictions about how he will think and respond in different situations. His goals tell us he’s an ambitious character, striving to make the most out of himself and his career. His choices reveal his priorities in life: health, physical appearance, and family are all considered important - but difficult to maintain with a chock-full agenda. His habits tell us he’s the kind of person that actively pursues the knowledge and opinions of others when faced with new challenges. As you can imagine, information like this is a potential goldmine to marketers. But don’t get too excited yet. Now that you have the data, the real work starts. Having all that information at your disposal sure is nice. 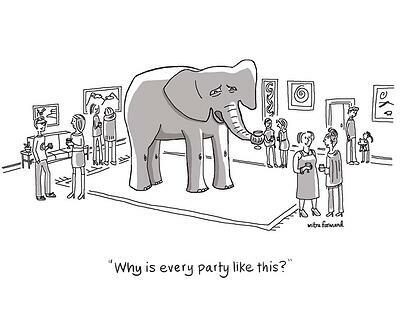 But it’s not very useful if you don’t know how to interpret the data or make proper use of it. Both can be tricky objectives on their own. But thankfully, a little psychological expertise can go a long way. 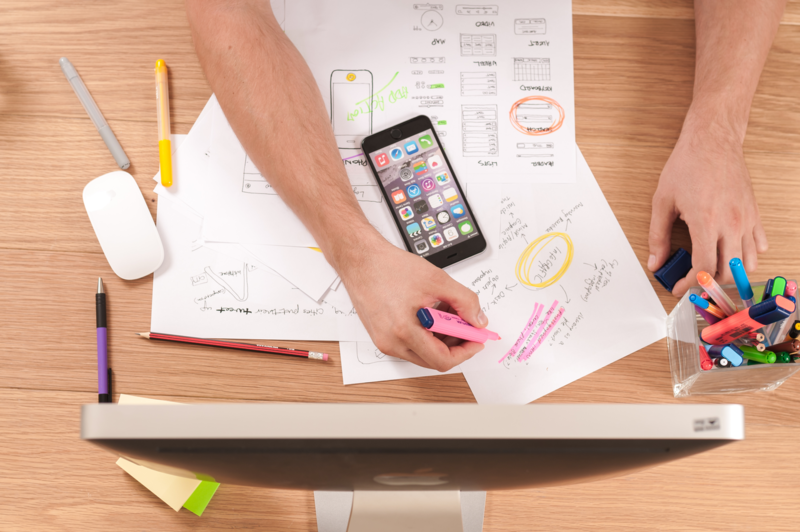 To help you on your way, we’ve outlined a few pointers that will help make sure your new digital marketing plan, customer experience strategy, or general communication approach sticks. The sensible place to start is by updating your old shopper profiles. Adding some psychographic metrics to the mix will help you go into much more detail than you were able to before. But how? Check out this article on how to find psychographic data and make it actionable. However, translating all those numbers and statistics into broad psychological traits can be difficult. Here’s where it pays off to do some homework before diving into your dataset head-first. First, try to figure out what specific type of indicators you are looking for and what they might say about a person’s predicted behavior. Let’s go back to Peter for a second. His desire to make the most out of life fits the textbook definition of a maximizer. That makes it safe to say he takes his time browsing different products until he finds the best possible deal. Moreover, it’s likely that Peter will pay a little bit more for top-shelf products if they’re worth the money. Unfortunately, his busy schedule doesn't always allow for the time to carry out such extensive research. To prevent his brain from going into cognitive overload, Peter will be naturally prone to services that make his life easier. Too much hassle with issues like delivery or returns are likely to be a big turn-off. Also, remember how Peter loves to attend networking events and read books about entrepreneurship? This tells us he’s interested in learning more about the thoughts and opinions of his peers, as well as experts in his industry. Therefore, authority and social proof messages will likely play a big role in his decisions. Based on the psychological profiles we’ve now set up, we’re able to tailor any type of message in our communication to the needs, motivations, and (sub)conscious triggers that we expect to be most relevant to the customer. Let’s say our buddy Peter is looking to get himself new smartphone. He might come across an ad that lists a bunch of impressive technical specs, like a 12-megapixel camera and countless gigabytes of memory. Impressive, but these aspects are not directly relevant for Peter. It’s unlikely the ad will hold his attention for a long time. You can be sure Peter’s interest is piqued, as the ad seems to understand exactly what he needs. Next, Peter heads over to the retailer’s website to do a little research. As we know, he likes to take his time and compare different options before making a final decision. To save Peter some time, you could use product tags that highlight the options he is most likely to be interested in. For example, play into Cialdini’s principles of authority and social proof use by using “best price-value,” “bestsellers,” or “expert pick” messages. Product Development: Come up with new product ideas by figuring out what your audience is interested in and what problems you can solve for them. 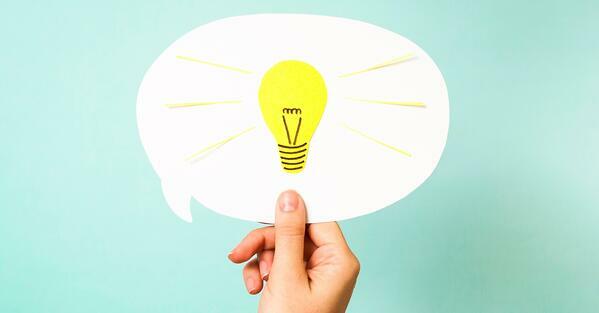 Inbound Marketing: Brainstorm new ideas for content by researching new topics your audience might be searching for. Sales: Based on your findings, identify previously untapped target segments that could be interested in what you have to offer. Data Analysis: Use your new insights to run new tests to better analyze your website’s performance. For example, use data insights to segment your audience base don psychographics and serve each group the optimal message at the right time in the funnel (or get Crobox to do it for you ;). 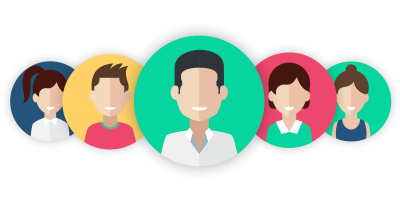 Customer Care: Use psychographic data to help your personnel be more empathetic towards customers and better understand their problems. Additionally, if you’re looking for more inspiration, this article on Sumo might offer some more useful tips. There you have it, your first crash course to psychographic profiles! Looking for more information? Check out our blog post on the most common pitfalls of psychographic research. 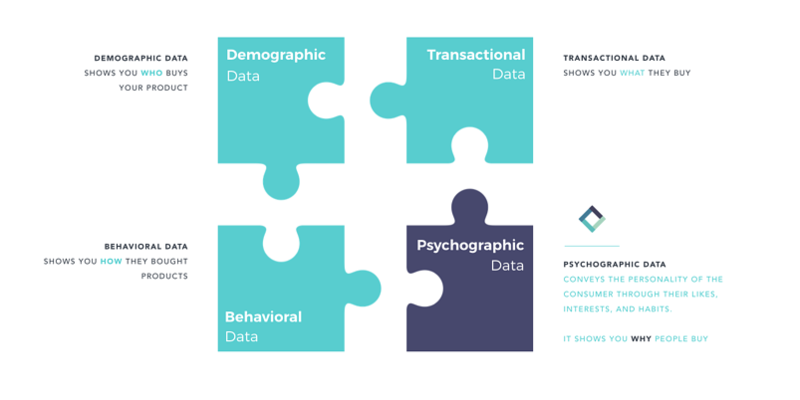 Psychographic data is the missing piece of the customer puzzle, adding to demographics, behavioral, and transactional data. 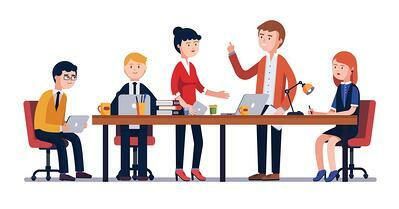 Whereas demographics make use of absolute factors like age, gender, and income to describe customers, psychographics rely on actions, opinions, and interests instead. With this data, you’ll be able to make more detailed customer profiles and create personalized messages backed by psychological insights. This is a multifunctional tool that you can use to improve almost every aspect of your business.